Hanoi is half way between its difficult past and a promising future of small shops with the latest fashion and beautiful handicrafts. These tiny shops in the Old Quarter make shopping in Hanoi a delight. The city is like an outlet mall, where you can shop for treasures made in dozens of small craft villages around it, in ways that stretch back over a thousand years. Great streets are everywhere and your hotel front desk can point you in the right direction. If you're staying in the Old Quarter, you can walk everywhere. Don't Miss Phang. In the streets of Hanoi’s Old Quarter, you really discover shopping as part of daily life. Before Amazon, before big bucks stores, before the days of suburbs and mega mall parking lots, there was a time when shopping was much more than buying. Seeing your friends in the streets, squatting on plastic stools for an al fresco Pho, poking at silk dresses and stainless steels lunch buckets and plastic stars from last Christmas. ​Shopping in the Old Quarter can be a challenge. Locals have the practice of shopping from their bikes so they get closer to the edge of the road to look at the items for sale. Then, the sellers bring it to them and if they like it, the close the transaction right there. You have to be super attentive when you walk through the streets. The sidewalks are often full of motorbikes, tables and chairs for people to eat or people working that your choice is really to walk on the road. With heavy traffic of cars and motorbikes, your dexterity in avoiding any of these hitting you can be tested. However, I haven't yet seen anyone hit so take courage and enjoy the myriad of things offered. The Old Quarter still retains its old division into artisan alleys such as silversmiths, paper and printing, silk making, sewing and embroidery, et al. Exploring these streets is so much fun. Still in the Old Quarter is Dong Xuan, the biggest covered market in Hanoi. This market offers all kinds of items shoppers look for from food to clothing, shoes, hats, toys, beads and fabrics. In the weekends, the streets outside become a very busy night market. Sometimes, there are musicians playing some traditional music. This place is worth checking out just for the fun of it. Walking through this street from Hoan Kiem Lake, you will go through store after store of fashion from tops to dresses to t-shirts and accessories. Check out the tiny alleys branching from the street. They are just as interesting and fun. If you love to sew, this is the street for you. You ca find anything you need for sewing. All kinds of buttons and accessories, threads, needles, lining, etc. Hang Gai is one of my favourite streets in the Old Quarter. I always love to visit my favourite shop in Hang Gai is Tan My Design at 61/66 Hang Gai. Here you can look at well designed clothing and accessories, finely embroidered table cloth and napkins, bed linen, beautifully crafted home decor, and some of the finest and thoughtfully designed lacquerware I have seen. For your home, you can get top quality accessories, and art work. Our favourite are those copper sculptured ants and the four-faced Buddha as well as the lacquer paintings. What is even better in Tan My is the Cafe where Grumpy husbands and boyfriends can settle down, relax and enjoy an espresso or get online with the free Wi-Fi while you go up to the other floors and enjoy more shopping. A staff is always there to help you with things you want to fit and also bring your purchases to the counter. She keeps her distance until you need her so you are free to roam around the store. No shopping experience could be better than this. In fact, I was there shopping one day and I had lotus tea afterwards. It was very refreshing and calming. Just across Tan My is Hannah, Memory of Hanoi. That's Hannah in the picture and her store carries the most beautiful scarves and ceramics I have seen in Hanoi. They are of excellent quality as well and the designs you'll find there you can't find in the streets. And below, have a peek of some of the scarves in Hannah. Around the Roman Catholic Cathedral are boutiques that sell and make apparel, souvenirs, crafts, and other items. Three of the stores I like to check out are Song, L'Atelier and Bambou. I also like to go and buy at Nagu coffee and souvenir items beautifully embroidered in Vietnam. Cotton apparel for kids and adults are also sold in this store. There is also Ajisa which offers quality hand made products from Vietnam. The latest I checked out is May and I got the most fabulous bag for socks. As these 3 are all in a cluster in Nha To Street, you can enjoy all the browsing you want. For beautiful embroidery, this is the place to go: Duc Thanh, 1 Trang Thi St. here, you can find the famous embroidery pieces of the master, Le Van Kinh. For me, its main draw is the second floor that is wholly devoted to selling fabrics. Any kind of fabric you like is available there from cotton to linen to wool, synthetics and other unrecognizable ones. Just across from Cho Hom is Thai Tuan, where you can buy manufactured silk fabrics. This store is the showroom of the fabric manufacturer, Thai Tuan, so there are many choices. Besides, they also custom make ao dai, the traditional Vietnamese dress. If you are not into ao dai, you can bring your cloth in one of the shops in the Old Quarter that does sewing. There are a few around the Roman Catholic Cathedral as well. Prices in Thai Tuan are fixed and displayed in bold print so there is no need to haggle. There's always a staff member who speaks English to help you with your order. If you show them the style, they'll know exactly how much fabric you need. Here's the showroom address: 71 Pho Hue St., Hai Ba Trung District, Hanoi. Since the time I found this store, it has become a favourite. Just visited this store again the other day and I was really impressed. I got several clothes from their new arrivals as well as from their winter clothing sale. Their staff are always patient when they help you try on the clothes. The designs are beautiful and the prices are really good, not as expensive as the other stores. Check out their store in Kim Ma as the street offers many other clothing stores. You can spend time there just going from one store to the other. For those who love to buy lacquerware, this is the place to go. This place also sells other craft items like scarves and those made from horn and what is interesting is you can watch how these items are made in their workshops right there in the complex. Working with women in Vietnam and Cambodia, this NGO sells some of the most beautiful and intricate quilts. You can also order and have it mailed to your place. The staff here speak English and are always happy to help. I just bought a baby quilt there two weeks ago and they also mailed it for me to Australia. Fair Trade and organic store dedicated to saving traditional handicraft. Indigo has a workshop on top of the shop at Van Mieu staffed by the deaf and mute. You can see how they tie dye cloth, embroider accessories into some of the finest woven cloth. Right beside the Temple of Literature, this store offers topnotch design and quality in natural fabrics. There are also unique home and personal accessories such as scarves, bags and fashion jewelry in ethnic design as well as organic soap and teas from Vietnam. My husband's shirts fitted him perfectly. I ordered an item there and the owner would not let me have it until he has perfected it so Indigo's commitment to quality is very high. For more on Indigo, check this out. 22 Dien Bien Phu or 21 B. Phan Dinh Phung St. I had a fast shopping spree in the United States last summer just before I left for Hanoi. Upon arrival in Hanoi, I scrutinized the pants I bought as well as the light coat for my husband which we chose carefully in one of the top end stores. I found out that they were made in Vietnam. They were a good fit and of excellent quality. So, I started scouring the Made in Vietnam stores. I am small so I can find my size but there are many who will have difficulty looking for their size. Your best bet is to have some clothes custom made. Also, try the Tolia shop in the ground floor of Hanoi Tower/Somerset Grand. I come down here all the time as I live in Somerset and their coats and bags are really worthwhile. They are marked Northface and the quality is good but I can't vouch for their authenticity. Vietnam has gone beyond the usual cheap clothing manufactured in their factories as young Vietnamese designers create a more sophisticated fashion industry. One to watch is Eco Fashion designer, Than Vu of Kilomet 109, who not only creates unique designs but help Vietnamese villagers improve their traditional fabric. For her work, she was recently the Winner of the British Fashion Councils Young Creative Entrepeneur Award. If you like uniquely crafted bags, this is the place to go. I got a bag from here but when I arrived in New York, my friend really liked it so I gave it to her. Supporting this store is investing in the livelihood of ethnic minorities. The products are well crafted from cotton and linen apparel to lacquerware, bambooware, ceramics and other gift items. Our grandchildren love the embroidered wallets I bought from this store. They love to use these as pencil cases. Last time, I bought our neighbour's kids (assorted teens and young adults) some of the leg bracelets. The design and colours are unique to Vietnam but these kids love to wear these all the time and ordered more. For aficionados of home accessories, check out UMA outlets. UMA is a Swedish manufacturer with several outlets in Hanoi. They have beautiful cushions, dining and kitchen items to fill your luggage. Other than these, coffee is one of the best Vietnam buys. You can try whatever coffee that's unfamiliar to you. Many stores that sell these coffee always offer to make you a cup. These stores are not hard to find as you walk along the streets in the Old Quarter. Try the Weasel Coffee and you'll be surprised at how the weasels have added their wonderful enhancement to an otherwise regular coffee. If tea is your preferred drink, Thai Nguyen Tea is the best in Vietnam. My friends in Canada to whom I gifted this tea really enjoyed it. The green tea is not bitter at all. For quality local furniture, go to Hang Da Market in the Old Quarter. There are several floors of furniture, local and Western design. 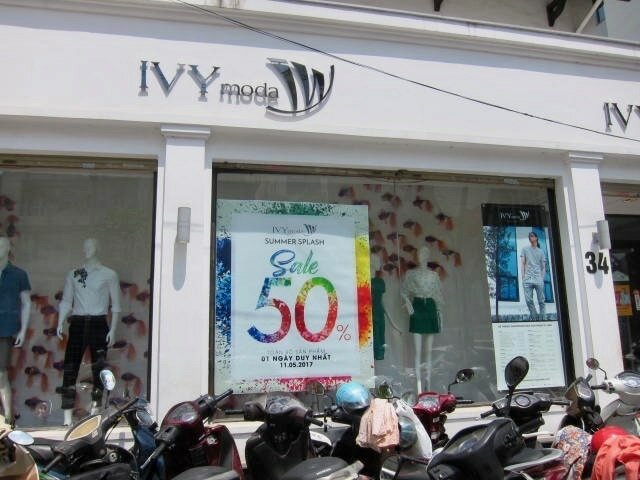 Here's my latest discovery, Ivy Mode store in Pho Ba Trieu. I was on my morning walk checking out streets close to us and I see lots of people going in this store. I saw on the window that they have a 50% sale. ​In I went and the store was jam-packed. I chose a few to try and went in the dressing room and people were trying clothes, three in a room. I went in and had fun with everyone, trying to their picks as well and making comments on what they have on. I decided to buy one dress and paying is another hurdle but just get in line and your time will come. It is, I found out, a very popular store for fashion conscious men and women in Hanoi. If you just can't travel to Hanoi, here's a beautiful lacquer box from Vietnam considered as great gift because of the auspicious red and the dragon fly symbol. You can get this in Amazon. Want more on shopping in Vietnam? Any other suggestions on where to shop in Hanoi?